Martial arts, aerobics, clogging, ballroom dancing and jazz dance are just a sample of the classes available through the city’s recreation center. The C.L. Simon Recreation Center also includes a gymnasium, weight room, gymnastics area and meeting rooms. Visit the website for a complete schedule of events. 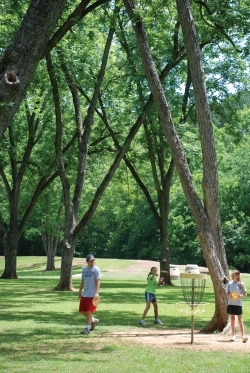 Nacogdoches boasts 20 city parks encompassing more than 389 acres. Wooded, open grasslands, small ponds, and recreational equipment — swings, slides, spray station, tennis courts, pavilions, trails, disc golf courses — offer many outdoor activities for people of all ages. The Lanana Creek hiking and biking trail begins on East Austin and follows Lanana Creek for 6.9 miles. Hop on the trail on E. Austin St. at Jimmy Hinds Park.The scenic route winds through the SFA campus and the Mast Arboretum and ends at the soccer and softball complex just south of the downtown area. The Banita Creek trail begins at Main St. and Pearl St. (the Hitch Lot) and goes north for 1.9 miles. Or take your best friend out for some fun at Dog Park Nacogdoches. Located at Banita Creek Park North, this off-leash dog park provides a place where dogs can socialize, play and exercise in a safe, clean and well-maintained fenced-in area.